Kids arts craft recipes with chalk, crayon, glue and paper mache recipes. 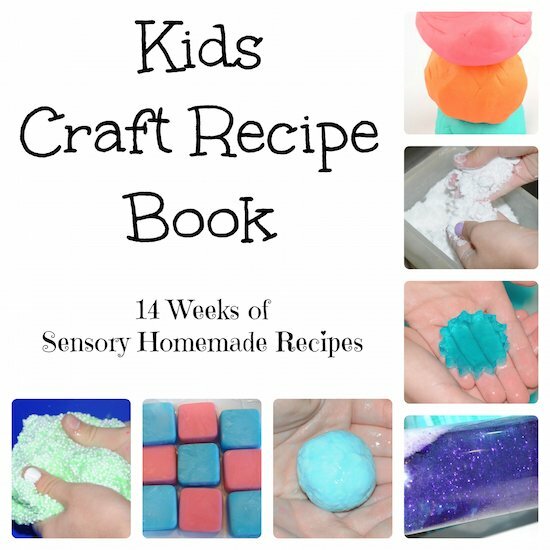 Kids arts craft recipes include recipes for many different creative projects. 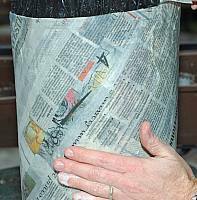 Are you planning a paper mache project? Do you know how to make a pinata from paper mache? Check out our pictures and recipe below. 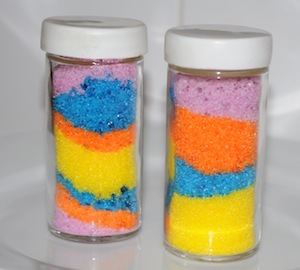 Or if you need homemade crayons, homemade paste or sand art ideas this page is for you. My favorite is the sand art. The recipes below will cost a small portion compared to buying a sand art kit. Peel crayons. Add muffin liners to a muffin pan or spray each section with cooking spray. Have your kids help sort and organize colors. 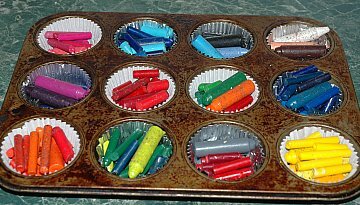 If you would like a multi colored crayon put all the crayon pieces together otherwise put crayon pieces of each color in muffin cups. Bake at 200 degrees until melted. Allow to cool. Combine flour and water and mix until creamy. Store in air tight container. For more durable paste, add 1/2 cup flour to 1 cup boiling water. Stir over low heat until thick and shiny. In top of double boiler, mix dry ingredients. Add water slowly, stirring out lumps. Cook over low heat, stirring constantly. Remove from heat when paste begins to thicken; it will thicken more as it cools. Keep covered. Add water to thin when necessary. Add two ingredients together. Tear 1 inch strips of newspaper or paper towels. Dip strips in a bowl of water and then dip in the flour water mixture. Remove the excess flour water mixture by pressing between your fingers. Place moistened strips in thin layers over a wire, bowl or balloon form. Let each layer dry before adding a new one. Paint when completely dry. Make a pinata with paper mache forming over a balloon for a round pinata. Mix the ingredients and allow to dry, stirring occasionally. It will take about 24 hours to dry. For deeper colors, use more paint. If sand is not available, use salt. 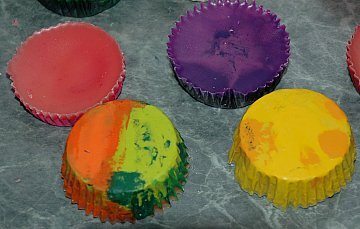 In plastic bag, add several drops of food coloring to ½ Cup sugar. Squeeze mixture together. Use for cooking projects such as cookie decorations or arts and crafts projects. Place food coloring into a bowl of rock salt. Add in rubbing alcohol and let sit about 10 minutes. Drain on towel and use for arts and craft projects. 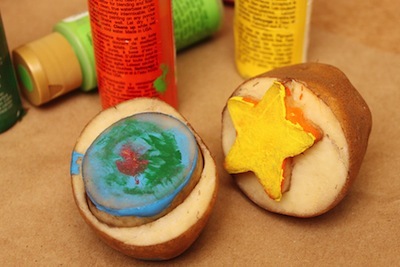 A fun way to create a stamp is by using a potato. Have an adult cut the potato in half and carve out a simple design like a heart, shape, etc. Dip the potato in paint and stamp on paper. Get an empty water bottle. Fill with vegetable oil 2/3 of the bottle. Then fill the rest with water. Add food coloring and glitter and there you have a wonderful Non-Toxic Lava Lamp. The next time you have eggs for breakfast ask to have six egg shells saved for you. The eggshells should be washed very well so that no egg is left in them. Dry them with a paper towel until they are completely dry. You can grind them in a bowl with the back of a spoon. Grind them in a bowl with a clean rock from outside. You can also use a mortar and pestle if you have one. Grind the eggshells into a fine powder, take out any little bits of egg shell that didn't grind up. You will need 1 Tbsp for one stick of chalk. Measure the flour and the hot water into a small bowl. Stir them together to make a paste. Put 1 Tbsp of eggshell powder into the paste and mix well. Don't be afraid to mash it with the back of whatever you are stirring it with. Shape mixture into a stick shape. Then roll it up in a paper towel cut to fit the piece of chalk. Let it dry. Drying may take about three days, so put it in a safe place where it won't get broke. After three days it's ready to use. Peel the paper off one end and you're ready to draw on your sidewalk. A small amount of tempera powdered paint can be added for color. 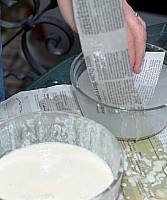 Mix paint powder and plaster powder in paper cups. Add water slowly to dry mixture until creamy, stirring well. Wait about 1 hour until chalk is hard. Firmly tap out of container. Back to Craft Recipes from kids arts craft recipes.